I have over twenty 10 min. flights on the plane now. The lifting tail works well in a narrow speed range. With the new DLE-35 engine the plane will do a climb when the throttle is advanced to about half to three-fourths, but will start to pitch down at WOT. I made a new stab with a symmetrical airfoil and I like it better. Next I'll play with the top wing incidence to see how much I can remove and still get good low speed performance. The landing speed is so slow it is ridiculous, I love it. The plane flew great with zero incidence in the top wing. Low speed is still stable with no tendency to stall or drop a wing. Almost done, now I have to figure out what the cowl will be like. Capped the ends of the straight wingtips instead of making them curved per the plans. Last edited by Joystick TX; 11-21-2017 at 04:48 AM. I had a hiccup on one of the elevator servos a few days ago. About half way through the flight, the right hand servo "centered" itself at about 30 degrees up elevator. It took full down elevator to keep the plane from climbing so I could land. I took the control horn off and re-centered it. The servo seemed to work okay under a load, no jumps or centering issues. My replacement servos came in today, I'll replace both sides so they are both the same age and manufacturer. Will do a tear-down on the old servo to see if I can find out what happened to cause it to jump off center. I have 49 flights on the plane now. I think next week I'll see how it flies without the top wing. Today was cold and rainy, so I decided to finish my plane by adding a cowl and some fake exhaust stacks. Been doing a lot of flying with it, just finished flight #62, all of them at least 10 minutes. Still having a lot of fun with it. I did manage to get in two flights before the weather turned to winter. The engine did not run well at all with the cowl on. It kept dying due to fuel starvation and would only run about half of the normal RPM. I took the cowl off and it ran great again. Seems like the cowl was causing a pressure problem with the carb vent. I soldered a short brass tube on it and ran a short length of fuel tubing through the firewall so the carb could get static air. The old saying "no good deed goes unpunished" is alive and well. Ground run today was good. Will try to fly later today when the winds die down and the air warms up. The tube on the carb vent fixed the ground running problem. The engine was overheating in the air after about five minutes. I made a new cowl with a large screened opening. That should end the overheating problem. Just have to wait until we get some warmer weather to check it out. what is the CofG for the 76 version? The original plans called for a CG 5" behind the leading edge of the top wing. Mine has been modified a lot from the original plans. The wingspan is the same, but the top and bottom wing cords are different, the nose is longer, there is no stagger between the wings, the horizontal stab now has a symmetrical airfoil instead of a lifting tail, and more down thrust has been added to the engine. No weight has been added to achieve a good balance. I used a Vanessa balancer to get the CG close to the 1/3 point on the bottom airfoil as if the plane had no top wing since the stagger is zero. Then I adjusted the CG, by moving things around, to get the plane to do straight flight on an inverted 45 degree up-line. I also made sure the CG was far enough to the rear, and the elevator throw was correct, so the plane would flare on landing without dropping a wing. The static CG remains the same with or without the top wing. Tyvm! The stock CG from the plans is perfect. I can work with it from there. Got a couple more flights with the new cowl. Everything is working good now. With 12 each 1/4" nylon bolts to hold the wings on, it takes a while to get all the bolts fastened. I've been using an electric screwdriver to put them in to speed up the assembly process at the field. Problem is that the nylon bolts are the slotted type and the flat blade slips out very easily. I put some heat shrink tubing around the head to keep the screwdriver centered. This will also work on smaller slotted screws and bolts. I added a b**b drop system to the biplane to provide a little more fun and excitement. Update: I have 105 flights on the plane so far, almost all of them right at 10 minutes. The b**b drop system is still working great, I use it once on every flight. The DLE-35 engine is running great. There have been no cooling problems in the over 90 degree weather. I did have one more problem, an ON/OFF switch failed on flight number 101. The power wire broke off inside the switch. It didn't cause a crash due to having two ON/OFF switches and two batteries. I run two switches on all my planes since it seems to be the weakest link in the control system. Just passed 130 flights of 10 min. each. The new plane smell is gone and I'm getting close to testing my theory that the plane will fly with only the bottom wing. I don't think the CG will change much when the top wing is removed. Some minor, hopefully, trim changes may be required. Still flying and having fun. joystic, why the changes ( longer nose moment and no stagger) ?. I can see the longer nose moment as an attempt to take some of the "biplane squirreliness" out of the plane, but I see no advantage in removing the stagger. just curios....... I plan to build a Lazy Ace out of coro, too with a couple of my own mods. 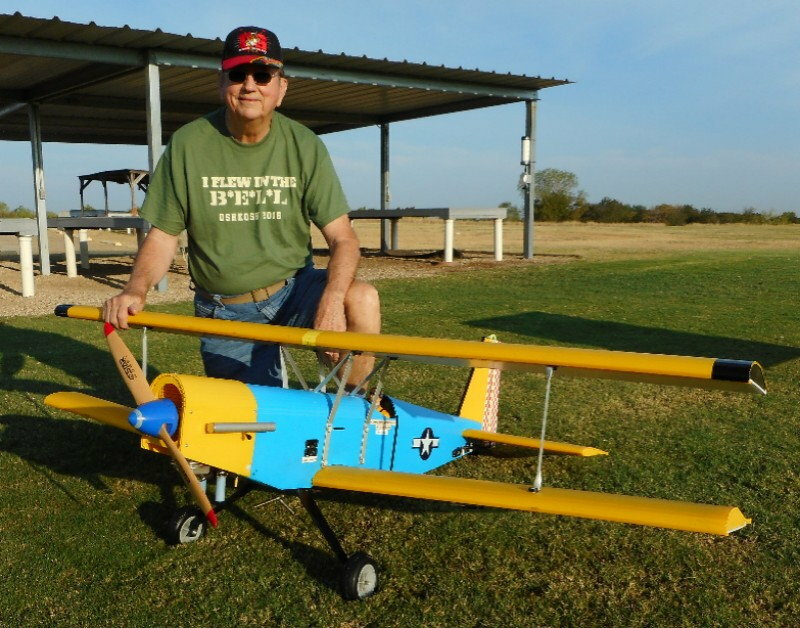 this thread came along at just the right time and any and all information I can gather will certainly help with my first biplane build. . The longer nose mod was not to take the squirreliness out, it was to compensate for the weight of the coroplast behind the CG. The removal of the stagger was for the same reason. The nose can only be made so long, before the flight performance would be affected. In order to keep the stagger, I would have had to add 3 lbs of weight to the nose. The lifting tail design was also eliminated due to the pitch changes it produced over the wide speed range of the gas powered model vs the narrow speed range of the glow powered and much lighter original model. If you build a smaller version, or use a smaller engine, the weight of the coroplast will be a problem. I would not recommend reducing the size even if 2 mm coroplast is used. There is a density/sq foot rule to consider. AH,...ok,..... I call it,... "Build to balance". I try to do it on every plane I build. much better than adding weight. I plan on building at least the 76 inch version. coroplast is a bit heavy ! 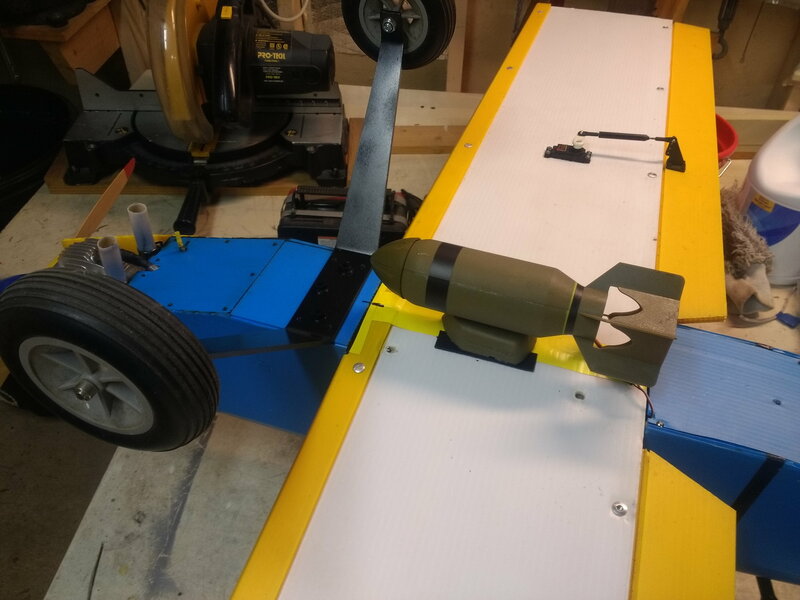 I have a 70 inch coro kadet trainer that weighs a about a pound more than the same plane in wood, but it flies fine with a .46 in it. when I first built it I have to admit I was concerned about what it weighed. I could have made the nose a little longer , too,.....I did have to add a good chunk of lead to get it to balance. it was my first coro project, so I just built it to plans. if I did it again I would make the nose longer, too. it works as it is,.... it doesn't really do much more than just cruise around, being trainer. still, I fly it often because it's an easy to fly, no pressure, stable flying plane. Had an interesting thing happen on my biplane a couple of days ago. 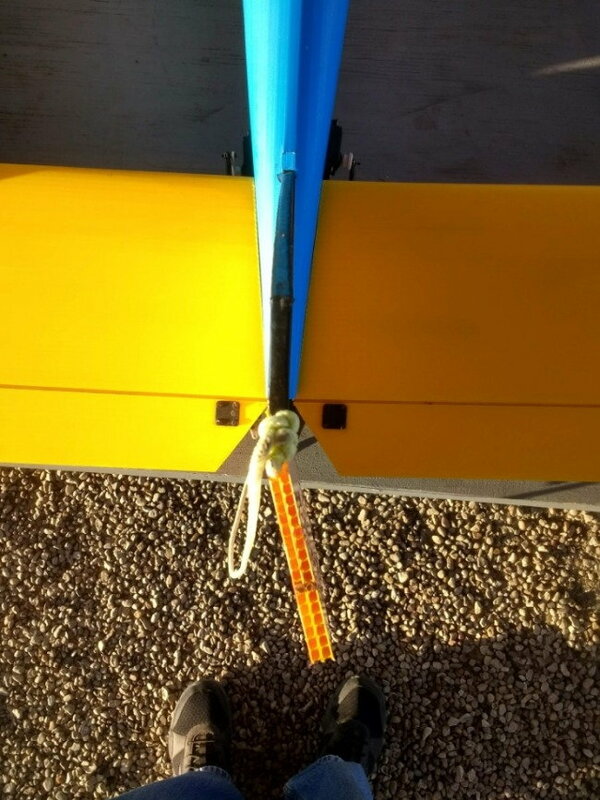 The HD-1501MG servo on my rudder went from zero degrees on takeoff to about 20 degrees right shortly after takeoff. I did have one do that last year on my elevator, it went to about a 20 degree up elevator position and I replaced the servo. I checked the rudder servo torque to see if any of the gears were stripped, everything seemed okay. I just repositioned the control arm and flew another flight. The right and left range were not changed, the movement was okay in both directions. It worked okay and zero didn't change again. I'll replace the servo before my next flight. Seems strange that the servos would do this. Has anyone else had this happen? Last edited by Joystick TX; 12-05-2018 at 05:26 PM. They have the 4'x8' sheets in 4mm and 2mm thickness in over 20 different color and the prices are good. 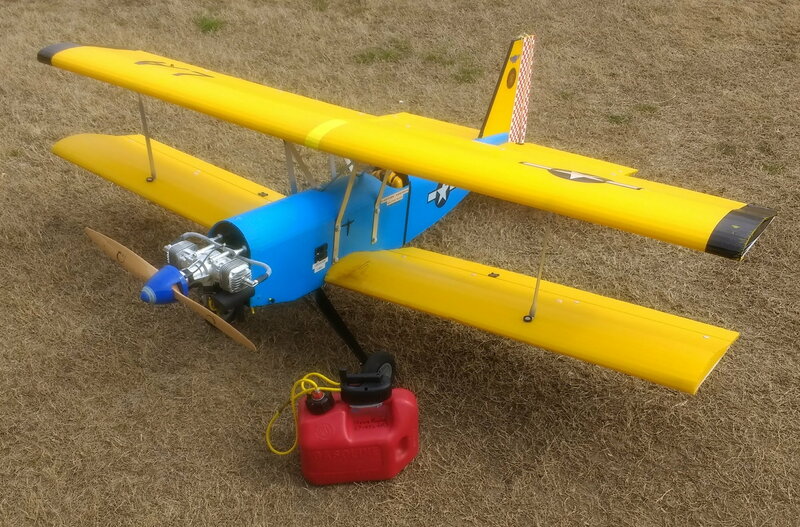 After 150 ea 10 minute flights, I finally bit the bullet and ordered a DLE 40cc Twin for the bipe. It will look great with the cylinders poking out on each side of the fuselage. The plane does not need the extra power, but it will be fun and I've never had a twin before. Got twelve 10 minute flights on the new DLE 40cc Twin engine so far, a total of 162 flights for the plane. It is my favorite plane now for sure. Finally have a decent video. Lots of touch n goes, trying to get some good three point landings. Had some good wind gusts and cross winds, both of which are not good for me and my reflexes. At least the video shows the overall performance of the plane. It's not the least bit sluggish and as you can see, it can take a beating. How much does it weigh it seems to have a heck of a sink rate mine would coast all the way across the field at the speeds you seem to be landing at.